Around 1 in 11 (8.8%) adults aged 16 to 59 had taken an illicit drug in the last year. However, this proportion more than doubled when looking at the age subgroup of 16 to 24 year-olds (18.9%). Levels of last year drug use in 2013/14 were higher than in 2012 to 2013. 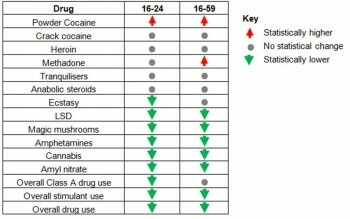 In 2012 to 2013, 8.1% of 16 to 59 year-olds and 16.2% of 16 to 24 year-olds had taken an illicit drug in the last year. However, these figures were both lower than in 1996. Cocaine, ecstasy, LSD and ketamine use increased between 2012 to 2013 and 2013 to 2014. 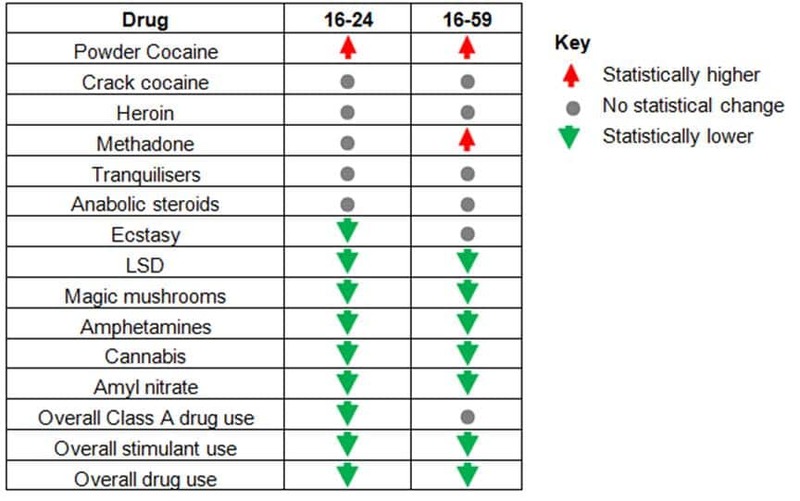 However there were no statistically significant decreases in last year drug use of any individual drug types among 16 to 59 year olds between 2012 to 20 13 and 2013 to 2014. Around one-third of adults had taken drugs at some point during their lifetime. Of 16 to 59 year olds, 35.6% had reported ever using drugs. Figure 9.21 looks at longer term trends in drug use from the survey highlighting that whilst the use of certain drugs and drug use overall has fallen, the use of Powder Cocaine and Methadone has increased. Problematic drug users (PDU’s) classified as those using opiates and crack cocaine, place a disproportionately large burden on the substance misuse treatment services. A prevalence estimate for opiate and crack users (OCU) released by the National Treatment Agency estimated that in 2009-10, 6.18 people per 1000 aged 18 to 64 in Devon were opiate and crack users. This was lower, but not statistically different to the South West rate (8.95 per 1,000) and national rate (9.24 per 1,000) and equated to an estimated 2887 users. Combining prevalence estimates from the British Crime Survey for age, gender, ONS classification and deprivation with Devon population data enables prevalence estimates to be created locally. Using this methodology, the prevalence estimates for Devon for the 16-24 and 16-59 year age groups and gender are shown in tables 9.7 and 9.8. The use of new psychoactive substance (formerly known as ‘legal highs’) is increasing. These are defined by the UK government as ‘a narcotic or psychotropic substance newly available in the UK [and mostly but not exclusively synthetic] which may pose a public health threat comparable to drugs controlled under the Misuse of Drugs Act 1971.’ New psychoactive substances were covered in the Devon Strategic Assessment 2013-14 (http://www.devon.gov.uk/devon_strategic_assessment_2013.14technical_report_2014.pdf), which emphasised the point the term ‘legal’ is particularly misleading as many of these substances are quickly made illegal. The Strategic Assessment also highlights that the Devon Drug and Alcohol Action Team (DAAT) is working with colleagues from a range of organisations including treatment providers, Young People’s services, Police, Community Safety and Trading Standards across Devon to monitor the emerging issue of NPS. The work aims to explore the nature, extent and impact of these substances and to consider ways of working together to develop a coordinated approach. Since April 2013 the Drug Treatment Monitoring System database has required treatment providers to collect data of NPS use from everyone entering substance misuse treatment and it is hoped that this will become available from 2015-2016. Other agencies are likewise now collecting data more consistently yet it is still difficult to gain a clear picture of NPS use across the County. All Community Safety Partnerships are linked into the Devon group looking at this new topic area to ensure they are up to speed with current trends and concerns as anecdotally these substances are implicated in anti-social behaviour locally.